Make Jewelry this Evening with a New eBook! This 12 Free Jewelry Projects to Make This Evening eBook is a collection of simple and quick projects that you can start and finish in an evening. Most of them can be finished in under 2 hours and many under an hour. This way you can’t use the time excuse anymore! Jewelry projects are a great craft to work on when you’re sitting in front of the t.v. with your family and before you know it you”ll have a beautiful handcrafted piece of jewelry you can wear out the next day. There are some really gorgeous projects for everyone. 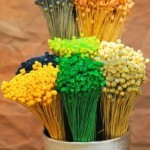 If you like working with wire, stringing, or stitching beads there is a project for you. And if you were hoping to expand your jewelry making skills, all the projects in this eBook are super easy to pick up so you can teach yourself a bead weaving technique tonight! These are just some of the projects you can find inside the pages of our eBook. You know you would like to learn how to make those cute dangle earrings or the perfect pressed pennies bracelet. And there are 8 more great projects to see! So don’t hesitate! Download the eBook today and let us know what you thought! Come on, it’s free so why not right? All summer I’ve been working on our new quilting website, FaveQuilts.com, and now that it is officially launching, I feel like a proud mama on the first day of kindergarten. I’m so excited to watch FaveQuilts.com grow and I’m hoping my baby will be popular with the other quilting blogs. In order to show everyone what we have to offer at FaveQuilts.com, I put together our very first quilting eBook with a collection of quilt patterns and tutorials from the new website. 12 Awesome Free Quilt Patterns and Small Quilted Projects includes an assortment of quilt patterns to show off the variety of projects featured on FaveQuilts.com. The free eBook is divided into three chapters: applique quilt patterns, patchwork quilt patterns, and small quilted projects. Each of the applique projects comes with a free printable applique template (so there’s no freehand drawing involved!). With these applique projects, you can create a beautiful quilt with bright, bold patterns in just a few hours. 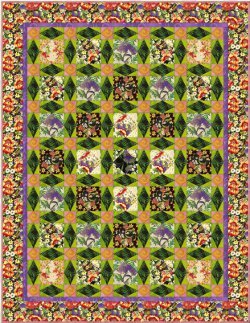 Start off with a Bug Jar Quilt (p. 12). This easy tutorial is especially designed for beginners, and the fusible applique takes only minutes! If you enjoy those meditative hours spent chain piecing at your sewing machine, our patchwork quilt patterns are for you. 12 Awesome Free Quilt Patterns and Small Quilted Projects includes several patchwork quilts to keep you busy stitching. The glorious garden quilt (p. 27) and concentric diamonds quilt (p. 24) are easy enough for newer quilters, while the apple core throw (p. 31) presents the challenge of curved piecing for intermediate quilters. One of the things I’ve learned as I’ve been building FaveQuilts is that quilting takes a very long time. In my limited quilting history I’ve only made baby quilts, and they took months since I’m not quite the committed crafter I imagine myself to be. I always assumed that serious quilters were whipping out a new king-sized quilt every other week, but I soon found that quilts could take months and even years if hand-stitching became involved. I know there are many quilters out there like myself who are looking for quick quilted projects to give them the satisfaction of quilting without the serious time commitments. That’s why I included a section of small quilted projects that you can finish in just a day or two in this free eBook. Projects like a simple patchwork pillow (p. 45) or a table runner (p. 34) are great for beginners because they speed up the learning curve. Experienced quilters will love the satisfaction of putting together a quilted piece in just a few hours! To get the patterns for all these wonderful quilt projects, download 12 Awesome Free Quilt Patterns and Small Quilted Projects here for free. I hope you enjoy this sampling of FaveQuilts.com! It’s National Sewing Month! 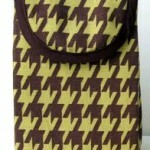 To celebrate, AllFreeSewing.com is hosting a special blog series throughout the entire month. Check back daily for posts featuring our favorite projects, new sewing videos and tutorials, guest blogs from talented designers and more. We’re also giving away a HUGE sewing prize at the end of the month. You won’t believe how EASY it is to WIN! Leave a comment on any of the blog posts with the headline “National Sewing Month”. Your comment will count as an entry into the giveaway. You are free to comment as often as once per blog post (for a total of 30 chances to win!). At the end of the month, we’ll pool all of the comments together and pick one lucky winner to win the mystery grand prize. And trust us; you want to win this one! Whether you’re already a sewing enthusiast or new to the craft, our hope is that this September will encourage you to create wonderful sewn projects. Now that I’m no longer in school, I really love this time of year. That dread of returning to homework, tests and papers has been replaced with a deep sense of nostalgia. This year, instead of fantasizing about new supplies and freshly-pressed outfits, I think I’ll craft away my back to school blues. Thankfully, AllFreeSewing‘s latest eBook, 6 Free Sewing Projects to Make for Going Back to School, is filled with back to school projects that you can wear or use immediately. I like that this eBook is filled with ideas for everyone. Whether you’re crafting for a kid or an adult, you’ll find crafty ideas in this eBook. Also, the projects cater to a variety of skill sets, so you can try something more difficult or go back to basics. My personal favorite project in this eBook is the Lunch Sack. Last year I decided to “go green” and carry a reusable tote to work each day instead of using (and then throwing away) a plastic bag. This project is a great option if you want to keep your food the correct temperature and save the environment from unnecessary waste. It’s honestly so easy to make this project – beginners can show off their work with pride! Are you excited for back to school season? Why or why not? Any diehard knitter knows that knitting isn’t just for the winter and fall. There are plenty of gorgeous, light and lacy patterns that can also be made during the warmer months – and plenty more in between. So if you’re a dedicated knitter, let our latest eBook, 15 Free Cute Knitting Patterns for Every Season provide you with fresh inspiration for the year. That’s right, inside you’ll find patterns for every time of year: spring, summer, winter and fall – all for FREE! Download the 15 Free Cute Knitting Patterns for Every Season eBook now! In addition to multiple staple patterns that are wonderful for sporting outdoors, this eBook also includes many classic patterns that could be given away as gifts during holiday season. Easily dress these free cute knitting patterns up or down depending on your accessories. One of my favorites from this group is the Eyelet Top Pattern on page 5. 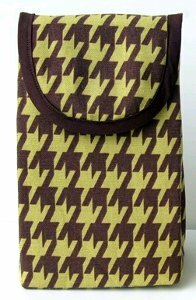 The beautiful earthy tone makes it a great pattern for both summer and spring. Wear it with a pair of jeans or a skirt – this classic pattern makes it easy to mix and match with various pieces from your closet. AllFreeChristmasCrafts is currently celebrating the next best thing to December 25th… Christmas in July! This fun tradition involves celebrating Christmas early with all of the same fun traditions that are usually saved for winter. The weather outside is certainly frightful, so why not get going on your Christmas crafting? It’s never too early to make get crafty and this eBook is sure to help you get in the spirit. Not sure what to make? We’ve got you covered with our very first eBook, “6 Adorable Homemade Christmas Crafts for Summer” eBook. Oh and one other thing… this eBook is completely free to download. That’s right folks, it costs absolutely nothing to get inspired and find six fantastic Christmas craft tutorials. So what are you waiting for? Download this eBook today! We’ve included all kinds of crafts – from a Ruffled Fabric Christmas Wreath to a Christmas Clay Pot Snowman. Cat lovers, listen up – there’s even a project called Crochet Christmas Mice. This crochet craft is designed specifically with your favorite feline in mind! Download your very own copy today! When I was trying to come up with fun things to do with my niece this weekend, I was having some trouble. It’s still a little too chilly to do a ton outside, but I was in the mood for Spring and wanted to do something that had to do with flowers. You can believe that I was ecstatic when I found this 26 Spring Crafts for Kids free eBook from FaveCrafts. Inside you can find projects in all different mediums and, the best part about it, you don’t have to break the bank making any of these projects. Many of the crafts can be made using regular household items like plastic cups, scraps of fabric, and pens. There are also 8 crafts specifically for Easter, and just in time too! My niece and I spend most of Saturday afternoon engrossed in the eBook and making different projects. 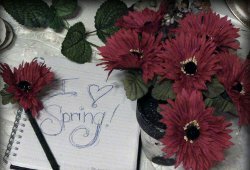 First we made these pretty flower pens from some old fabric flowers I had laying around and green tape. It was fun, super easy, and a really quick way to get right into our craft day. After that, we looked over some of the projects and found these adorable Walnut Animals. There are patterns for turtles, bears, and ducks but we decided to make a bunny since it’s so close to Easter. Well, in all honesty, there is a bunny and a turtle on my kitchen table right now. 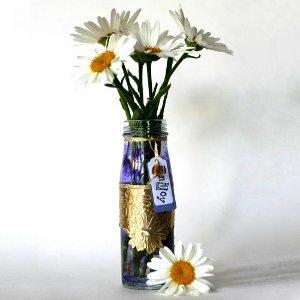 And finally, we (or rather she) decided that we needed to make vases for our pretty flower pens, so we made these easy daisy vases out of some old jars. My sister tells me that the vase and fake flowers are prominently displayed in their dining room, so all in all I’d say this eBook made our craft day very successful. Did it work out for you? FaveCrafts.com 365 Free Downloadable e-Books! I love downloading all the free e-books from FaveCrafts.com. The wonderful editors put together a variety of projects and how-tos into fun e-books so you can have the projects on hand anytime you need them. 24 Handmade Craft Ideas from 2010: A Year of Free Crafts contains the most popular crafts from 2010 including knitting, crochet, sewing, and general crafts. 12 Fun & Fabulous Mod Podge Projects is full of jewelry, decorations, and home decor ideas. Quick and Thrifty Free Crochet Patterns has 25 easy crochet patterns to make in a single sitting like dishcloths, flowers, and baby items. All you have to do is click to download the PDF! What is your favorite e-book so far? What crafts or techniques would you like to see in an e-book? Let us know by leaving a comment! It’s the continuiation of Blogger Appreciation at FaveCrafts with our newest Sewing eBook compiled of patterns and projects from all our crafty friends in the blogosphere. One of my favorite things about sewing crafts from bloggers is the extra bits of humor and personality that go into each and every project. It’s clear that real people do real sewing! Tons of photos and tips adorn the pages of this eBook so you’ll be able to recreate these sewing crafts with no problem. Included in this free eBook are tutorials on clothing, home decor, bags and clutches and holiday crafts. Sew Fun! Click here to download 25 Sewing Crafts from Bloggers eBook for FREE! New Christmas Crafts eBook, Free! Whether you’re a knitter, crocheter, paper crafter, scrapbooker, home decorator, child caretaker, gift giver or all-around crafter – it seems that crafting always kicks up a notch around the holidays. Start preparing now so that you’re not tacky-gluing the finishing touches on your Christmas cards the night before you want to send them out. Finish the knit potholders for your grandmother before New Year’s dinner. Expand your collection of Christmas ornaments in time to trim the tree with the family! Start now! Check out our latest eBook, Quick and Easy Christmas Crafts, to help you get started, it’s hot off the press! In it you’ll find 29 different projects to use for various aspects of your holiday planning and decorating. Handmade ornaments, home decor projects, greeting cards, kids’ crafts and gift giving ideas adorn the pages of this fabulous Christmas eBook.